I have a friend who always carries a spoon with her. In fact, just to make sure it doesn’t get lost or forgotten, she drilled a hole in the end and keeps it attached to her belt loop with a carabiner. When I asked her about it, she told me there are just too many situations in which one might want to have a spoon, and it never hurts to be prepared. (Plastic spoons, apparently, just don’t do the trick.) I respect that—although I don’t carry a spoon around myself, you’ll seldom see me without my Swiss army knife and my purple pen. 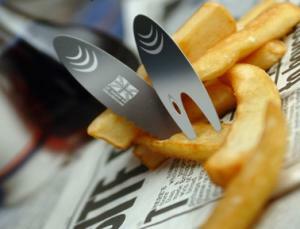 In that vein, I present the Wallet Fish & Chip Tool. If fish & chips is your thing, and if you can’t bear the thought of eating them with your fingers or with plastic cutlery, you might want to pack one of these babies. You get a stainless steel card the size of a credit card with the knife and fork (mostly) punched out; just pop the tabs and away you go. It’s available from such purveyors as touch of ginger, ShinyShack, and PresentProvider.com; you can even buy them in bulk, personalized with your company’s logo. Cost is less than £8 each. This tool is just one of a series of gadgets, all stamped from a single small sheet of stainless steel: toothpicks, bottle opener, comb, ice scraper, cufflinks, mirror, and so on. You can even get a set of lock picks, though how that’s legal for non-locksmiths, I’m not sure. Although this design appeals to my geeky sensibilities, I do start to wonder about a few things. First, once you’ve broken the tabs to remove the Fish & Chip Tools from the card, I’m not sure how you’re supposed to store them. (Surely they’re not intended for a single use, are they?) Second, I presume you’ll want to be careful to remove these from your wallet before getting on an airplane; I know I wouldn’t want to have to explain this to a security screener. And although any one wallet tool wouldn’t be too heavy, I’d hate to carry a wallet with half a dozen stainless steel cards—however useful they may be, a massively bulging wallet sort of defeats the purpose.